Why Doesn’t That Reed Play Well? Not all reeds are created equal. Reeds are often of inconsistent quality, and many do not play well enough to be of use. With this in mind, and assuming that you do not have the time to make your own single reeds, here are some ways you can improve the way you select and place your reeds on the mouthpiece that will give you better results. Reeds that are made of green or overly porous cane should be avoided. When a brand new reed has a slight greenish tinge to it, the cane it was made from has not been aged properly. The cane was harvested too soon, and will not yet make a good reed. Such reeds can be put away and stored for a year, and will improve with age. If, when placed in the mouth for moistening, you can easily draw air through the reed, it is too porous. Such a reed will absorb moisture too quickly, and will soon break down without ever creating a good tone. The best reeds are made from old, dense cane. These reeds will have a golden to golden brown coloring. The reed should also be cut well. When a reed is held up to the light, tip facing up, the outline of the heart of the reed should form an upside down “U” that is centered. Equal amounts of light should come through the reed on both sides, all the way up the sides and across the tip. Reeds that have light coming through them across most of the reed, or that have a “V” shape instead of a “U” should be avoided. Such reeds require adjustments with a reed knife, or do not have enough heart to ever play well. While professional reed performing artists usually hand make and adjust their reeds, most music educators do not have the time or the training to work on reeds in this way. By judiciously selecting reeds, the need for this type of work can be avoided in most elementary and secondary educational settings. Handbook for Making and Adjusting Single Reeds by Kalmen Opperman, though now out of print, is an excellent reference for those wishing to learn how to use a reed knife. Every reed should be balanced, which means both sides of the reed, left and right, should offer equal resistance. Take a reed and place your index finger behind the tip on the left side and gently flex it. Do the same on the right side. You will probably notice that one side of the tip is softer than the other–that is it offers less resistance. When this is so, the reed is unbalanced. If the difference is not too great, this imbalance can be compensated for by placing the reed on the mouthpiece slightly off center, with the reed off center in the direction of the soft side; if the reed is softer on the left side, then the reed should be placed on the mouthpiece of center to the left. If you cannot determine which side is softer, try offsetting the reed in both directions and see in which position the reed plays better. Most reeds will not play best centered on the mouthpiece. 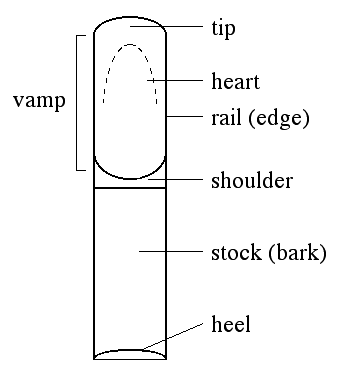 If the imbalance is more pronounced, try also offsetting the bottom (heel) of the reed in the opposite direction as the tip; if the tip is offset to the left, also offset the heel to the right. You can also try offsetting the heel and centering the tip. One of these positions will produce the best tone. Once the most desirable position for the reed is found, it is a good idea to mark the reed with arrows so you will know how to place that reed the next time you use it. I put an arrow pointing right or left at the bottom of the lay to indicate tip placement, and an arrow on the back of the reed to indicate heel placement. Your success with single reeds will improve dramatically once you are placing them correctly on the mouthpiece, and choosing wisely the reeds in which you will invest your time. While reeds are but one part of what is needed to produce a pleasant and characteristic tone, they are the sound source, and merit careful attention.